As there are 99 “actions,” we'd like to offer one more to round out the number: urban golf. 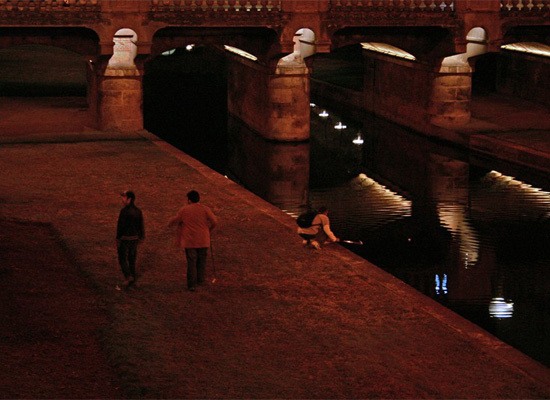 While the rules may differ in cities and even within cities, the game is invariably played in urban settings. Rather than in well-tended lawns, players tee offs on the street, sidewalks, alleys or on top of buildings. Urban parks, it would seem, are avoided, though certainly not a prohibited course. One aspect of the game that we find interesting is that it isn't merely the manifestation of ennui among the hipster crowd. It's guerrilla theater with the requisite social commentary. Urban golf is seen by many as social commentary on the nature of golf and its traditional opinions and attitudes [i.e., elitist, sexist and racist club policies]. 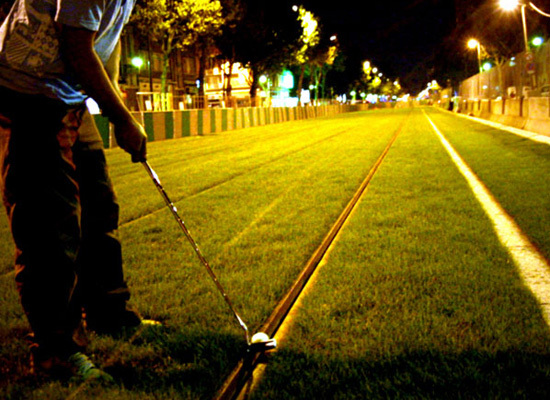 Considering golf pompous, dogmatic and quite often inaccessible, urban golfers worldwide have adopted many different urban environments as their new course to engage in this recreational pastime. Commonly, urban golf organisations tend toward using disused or under utilised urban areas to play golf, not just to reduce the risk of damage or injury, but also as a statement toward the development and reuse of the city. We haven't used this meme on this blog yet, so: is there an iPhone app for that? If not, it probably isn't too difficult to program an app that maps out an urban golf course, pinpoints where the teeing ground and “hole” are located, shows and vectorizes the streets or alleys or parks or bridges or whatever disparate features of the built landscape comprise the “fairway,” and lists what hazards to expect, for instance, traffic, storm drains and street furniture. Wired to sensors strategically placed on buildings and lamp posts outside the course, this app could even forecast wind speeds at various urban canyons. Perhaps a popular feature would sync your urban golf calendar to Twitter or Facebook, announcing your scheduled tee off time in the hopes that you will be joined by other enthusiasts. Once finished with one course, it will direct you to the next one and then further on to another and so on until the final hole. Collectively, these courses represent a new urban layer augmented physically and virtually onto the city. At the end of play, you will have explored your city from one end all the way to the other end, perhaps experienced it anew. It's worth further fantasizing, meanwhile, this imagined urban layer becoming more and more codified. Teeing grounds become permanently delineated, not just marked with chalk. Viewing stands are placed next to the hole. Building facades that abut the fairways will be colored to denote this border. As urban golf becomes grotesquely popular and insanely profitable through sponsorship, these courses become permanent fixtures, like (18) stadiums but carved out of existing urban fill. Traffic and pedestrian flow will be diverted. Commerce will colonize their edges. And the city will grow thick around these recreational voids, encrusting the stadiums with an enveloping shell. When urban golf suffers the inevitably crash in popularity, what happens to its walled game-spaces will be similar to The Stadium of Domitian, which later became Piazza Navona. It's also worth further fantasizing the notion that playing through all 18 holes across the city is a form of tactical tourism. 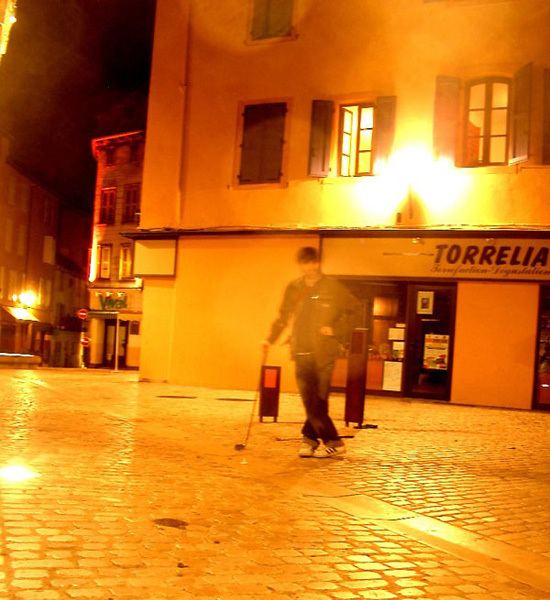 The photos decorating this post were downloaded from Urbangolf.fr. We may be embarrassingly stereotyping the people behind the websites, but we're imagining them to be part of an underground scene, whose members are mostly of African and Middle Eastern descent — the ones probably fictionally documented in La Haine. 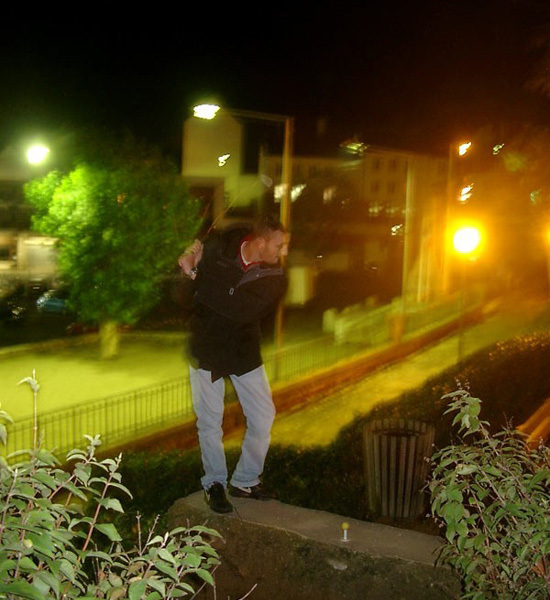 At night after a day of parkour, they trace the imaginary outlines of urban golf courses. Starting from the suburban ethnic ghettos that encircle Paris, from streets disconnected locally from Haussman's boulevards yet ironically connected via immigrations to the rest of the world, they infiltrate the interior arrondissements of the French capital. From cramped public housing high-rises of the banlieues to fin de siècle hôtels particuliers, from ringed roads to the spacious Jardin du Luxembourg, from the outer flames of race riots into the City of Light, a new breed of urban critics embarks on a self-guided tour of spatial inequity and conflict. Something else it taught me, and my childhood friends, was resourcefulness. At least, it taught us enough initiative to stage an impromptu game of soccer in the most inauspicious of circumstances... This ingenuity stretched to the area in which the game was to be played. No space was too unpromising or irregular that it could not serve as a venue. No surface too unyielding or unforgiving to the falling knee. No patch of ground -- grass, concrete, gravel, dirt -- was too closely situated to single-glazed window panes, no living room too lovingly decorated with delicate ornaments. Simon Kuper, in his book Football Against the Enemy, wrote: "The Brazilians say that even the smallest village has a church and a football field -- 'well, not always a church, but certainly a football field.'" In our own small-scale way, my friends and I were doing the same thing, marking our territory in a necessarily ad hoc fashion. Verily did the god Televisuos say, You can do anything if you put your mind to it. Especially if that mind is of the one-track sort. There happened to be a proper, full-size pitch yards away from where we lived. Yet despite this facility, we preferred to stage our small-sided kickabouts in small spaces bounded by walls and trees and hedges. In part, our games were a way of living out our dreams before the idea of their realisation seemed foolish. Our mini-Maracanas were, therefore, entirely appropriate venues. The professionals we sought to emulate were an exotic breed, they were non-existent in our parts. They resided on posters and television screens, in newspapers and magazines. They were beamed in from without, the grandiosity of the spectacle condensed to fit, doubtless with some loss in transit. It was easy to imagine that we were them -- they had already been shrunk to our scale. seem to remember a spike jonze/dinosaur jr video of some renown featuring urban golf..
Ha! I too thought the same thing upon reading the post. Classic video and song. Looks like urban soccer has already been deployed as an architectural tactic, via that Office for Unsolicited Architecture tumblr. Do they use regular golf balls? There is an app for that. Being a golfer with an iPhone I use GolfCard to track scoring and as a rangefinder. "Courses" can be mapped with the program and uploaded to Oobgolf for anyone with the app to download, so it could be used to map urban golf courses. There seems to be a difference of opinion regarding balls. Purists would use actual golfballs while those more sensitive to property damage issues use tennis balls, which do not fly as far but also do not readily fly through things. Did you read the mention at Spacing? Urban Frisbee Golf is pretty easy to manage and quite fun as well. It has similar benefits. While it does attract some police activity from time to time, typically being at night, aiming for lonely dumpsters down alleys and stop signs, that's all part of the game. From BBC News today, a 1-minute video report on urban golf in Paris: http://news.bbc.co.uk/2/hi/europe/8332329.stm. australianurbangolf.com - Handicaps are for Pensioners!